THERE WAS A TIME in the 1940s and early 1950s when South Los Angeles was a hotbed for jazz, with the creative expressions of such musical giants as Charlie Parker, Charles Mingus, Duke Ellington, Johnny Otis, Jimmy Witherspoon and Dizzy Gillespie wafted through the air and out of clubs along Central Avenue. At that time, Central Avenue and popular haunts such as the Dunbar Hotel were cultural icons in the early 20th century story of African-American social culture in Los Angeles. The Dunbar Hotel even hosted the first national convention of the National Association for the Advancement of Colored People (NAACP) held in the western United States. W.E.B Du Bois, Ray Charles, Billie Holiday and even former heavyweight champion Jack Johnson walked L.A.’s Central Avenue for years. But just as racial segregation had created the need for a Dunbar and the vibrant social scene along Central Avenue, so did the ensuing racial integration tear that scene apart. As the celebrities who had enlivened the South Los Angeles neighborhoods moved on to perform and frequent the hotels and clubs in Hollywood and other parts of L.A., Central Avenue fell into a period of deterioration, characterized by migration from the area and high vacancy rates. Ironically, the highest levels of racial segregation happened after federal civil rights laws were to have eliminated formal discrimination. However, from the 1960s through the late 20th century, this area of South Los Angeles saw some very hard times. As time heals all wounds, the decades of blight that plagued the Central Avenue corridor have begun to fade away and become reinvigorated with the addition of inspired building projects, the renovation of older buildings, and the infusion of new commerce and community engagement. 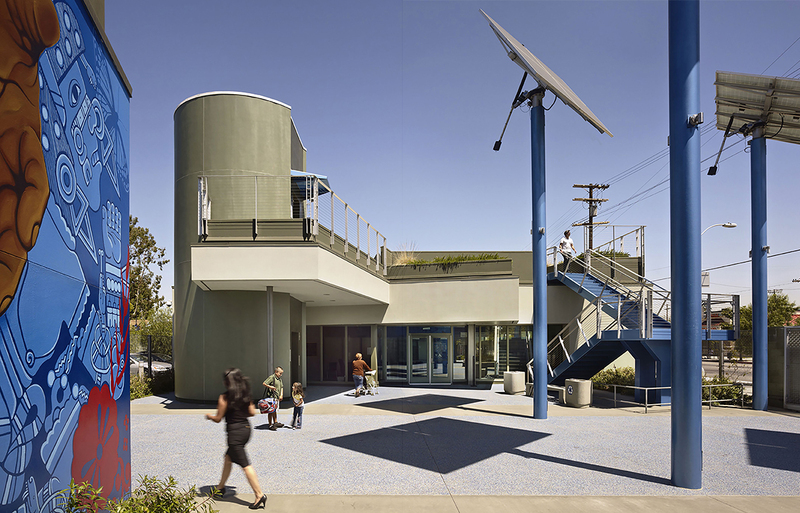 One new building that has had significant impact on the Central Avenue corridor is the Central Avenue Constituent Service Center (CACSC) envisioned and designed by Paul Murdoch Architects, an L.A. based architecture firm of international repute. The CACSC is a fine, stand-out building located between 43rd Street and 43rd Place in the heart of Central Avenue’s rejuvenated commercial district. This unique and modern civic center opened in early 2010. Since that time, it has been a catalyst for social and environmental change in South Los Angeles. 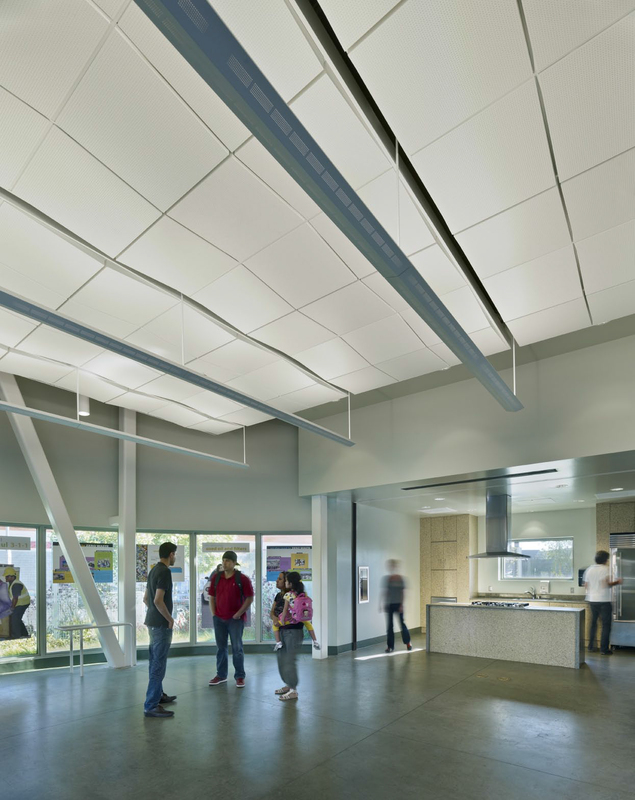 As a LEED Gold building it is innovative, community-oriented, and incorporates advanced technological features. The building has introduced much needed open space as well as public gathering areas, which have returned residents to the streets with pride. "It is more than just a building. It helped to recalibrate lives." The Central Avenue Constituent Service Center and the resulting exuberance that has followed it into the surrounding neighborhoods was the vision of L.A. Councilwoman Jan Perry, who has served since 2013 as the General Manager of the Los Angeles Economic and Workforce Development Department (EWDD) under Mayor Eric Garcetti. Describing the CACSC and its impact on the community in the past few years, she says “It is more than just a building. It helped to recalibrate [the community’s] lives, because now they have an option; they have an amenity that they never had before.” The building was not only a dream of Ms.Perry’s, but she was able to call it home when she served as the Councilwoman of the Ninth District of Los Angeles from 2001 until 2013.Ms. Perry is responsible for many projects around Central Avenue beyond the CACSC. “The Avenue”, as it was known for many decades was thrown into depression in the 1960s when local factories closed and the good jobs dried up in the adjacent neighborhoods. It really wasn’t until a $27.5-million mixed-use project at Central and 20th Street opened the floodgates of new opportunity in 2009 that growth and development came to this community. The project’s new, urban supermarket was such a big deal to the community that a line of almost 800 people met the business on its opening day. Following that, new housing developments,a Fresh & Easy Neighborhood Market, and substantial renovations to the historic Dunbar Hotel all contributed to the optimistic aura that now can be felt by every visitor to “The Avenue” and its neighborhoods these days.In an interview for the LA Times in 2010 on the revitalization of Central Avenue and the opening of the CACSC, Ms. Perry was quoted as saying, “even though it’s taken a long time, we are really hitting critical mass.” Three years afterwards, the LA Times confirmed this critical mass in its musical nostalgic headline “Jazz Patrons See L.A.’s Central Avenue on the Upswing”. 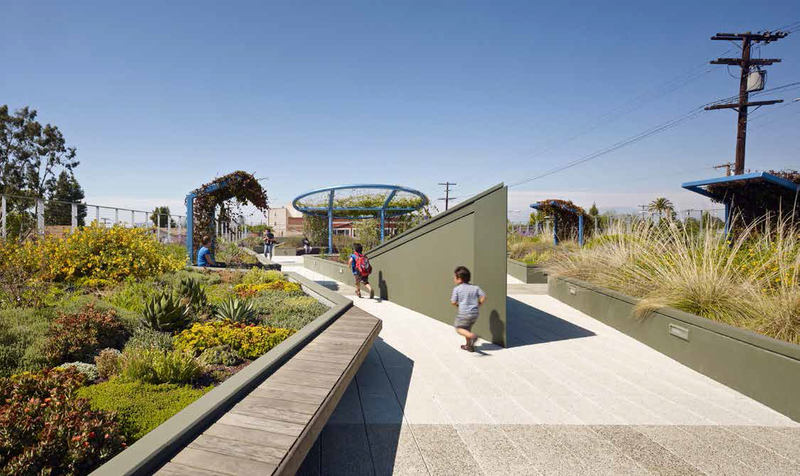 Ms. Perry’s vision of a revitalized South Los Angeles was working, and her collaboration with Paul Murdoch Architects led this neighborhood to receive a sustainable building of which to be proud. “Ms. 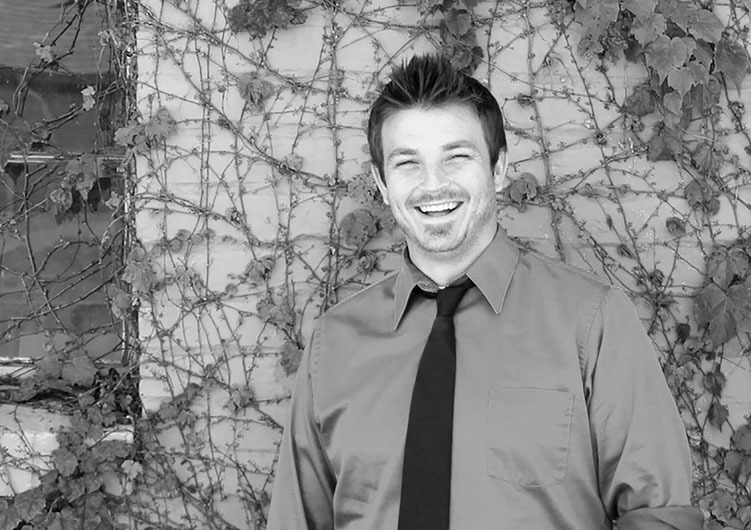 Perry wanted the community to not only appreciate that they could have progressive design in their neighborhood, but also as the building and others helped to catalyze future development in South Los Angeles that this would be a precedent for sustainable building going forward”, explains Paul Murdoch, lead designer and architect. Murdoch and his wife, Milena, have been designers, environmentalists and architectural activists in Los Angeles for over two decades. Having both worked with some of the most well-known, award winning architects in the world, the Murdochs’ firm is quickly becoming well-known in its own right as a poetic architectural avenger providing sustainable solutions with great aesthetic vision.Their design entries for world renowned memorial design projects, such as Constitution Gardens in Washington, D.C., the July 22 Memorials in Norway, as well as the Flight 93 National Memorial near Shanksville, Pennsylvania, built over the past few years, have brought them international recognition. piece. 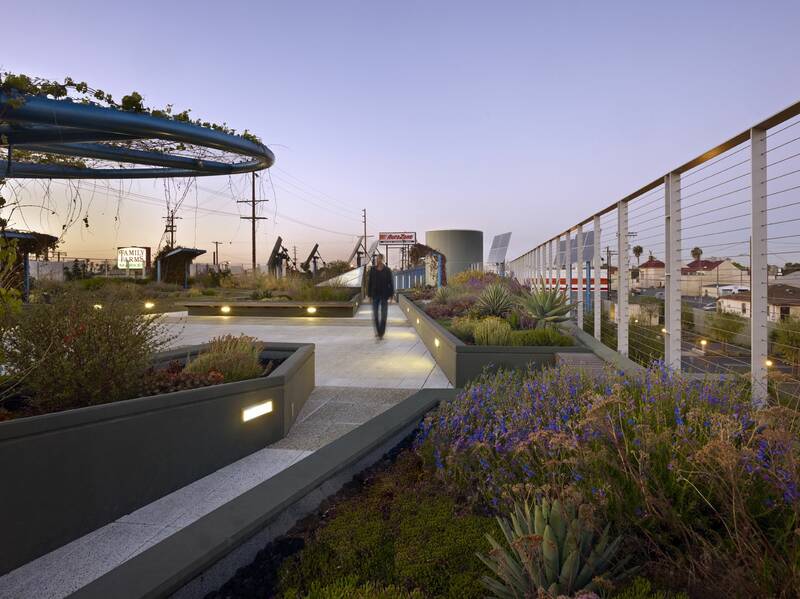 In fact, this 8,000 square foot public roof garden is the first public, municipal roof garden built by the City of Los Angeles, and roof plantings consist of organically grown species indigenous to Southern California. There is a 12-inch to 18-inch growing medium of scoria, aged compost, peat, sand, and perlite that is on top of a roof assembly built to withstand extreme Southern California temperatures. 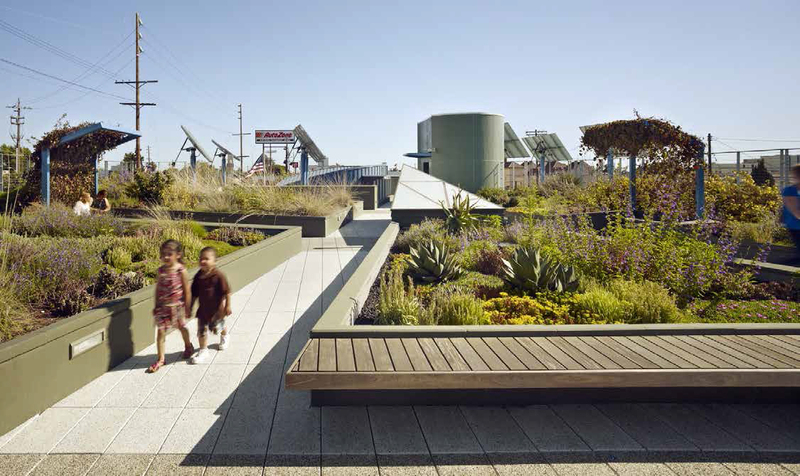 This roof garden helps mitigate stormwater runoff through an ingenious collection system, which cascades off the roof into a small pond at street level. Not only does the roof collect storm water, the whole site works to gather and store rainwater in a cistern that is located under the parking lot. 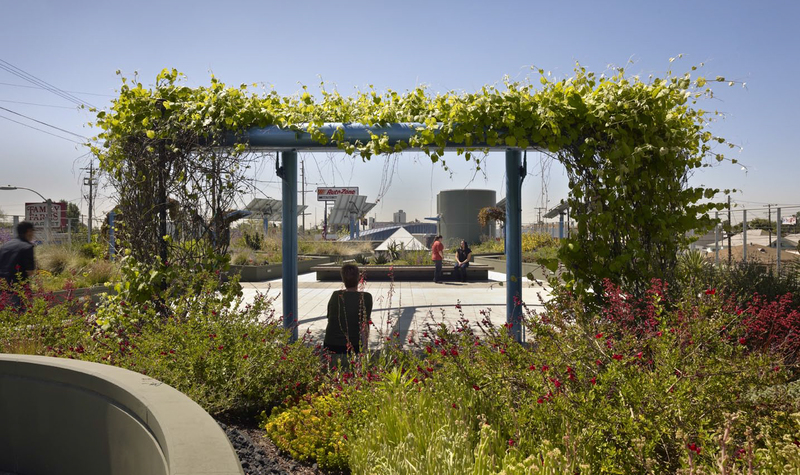 It is remarkable that more natural greenery can be found on this site than in almost any other location in South Los Angeles. The design team at Paul Murdoch Architects pushed the envelope of showing the community how green a facade could help transform the building and the Central Avenue streetscape. Other sustainable aspects of the project include photovoltaic arrays with sun tracking technology, natural lighting,and a “cool roof” system that reduces heat island effect and the energy load of the building.The CACSC is a mixed-use building, as it functions not only as the offices for the Ninth District of L.A.’s City Council, but also as a community gathering space, an exercise facility,a community kitchen, public garden space, an active learning tool for sustainable building design,and it hosts a vibrant local farmers market every Thursday for several hours. The multifunctional nature of the CACSC is really an additional feather in the cap of this neighborhood’s revitalization efforts. This building gives the community more cause to engage Central Avenue and offer so many more options for its neighborhood residents and visitors. 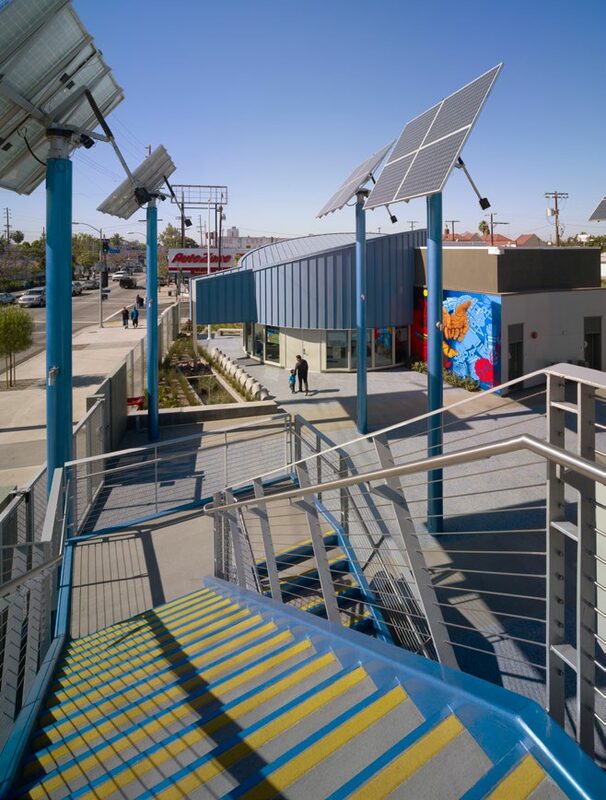 In terms of urban revitalization the Central Avenue Constituent Services Center is a wonderful aesthetic addition to a blighted area of Los Angeles.But in the context of true revitalization, this project obviously contributes much more than just adding aesthetic value. “The project has helped to start new businesses and investment along Central Avenue,” says Paul Murdoch. “It is helping to make change in that neighborhood and that is the main message.” What can be learned from this building is how a civic space can be envisioned to provide a sustainable solution by starting with the question “how can this building impact the people of the community?” The building provides recreation,commerce, exercise, and meeting space for a community that was not returning to the streets.Fear of street crime and the atmosphere of these blighted streets had kept many people avoiding Central Avenue for decades. The enjoyment that once characterized Central Avenue had simply vanished. However, with the opening of the CACSC “the residents and occupants leveraged what the design was doing to create more positive change in the community”, Murdoch said as he explained the design in terms of security in community spaces. Yes, it is true that when more of the community is on the streets, the streets become safer. 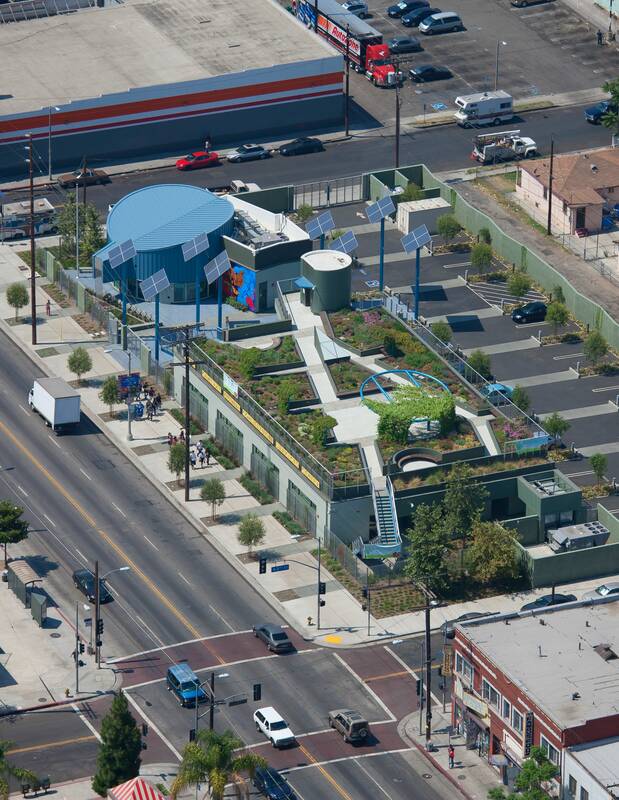 The building was also designed to be inward facing as it is supported by a safe space giving access to the public roof garden and to the parking lot. This design feature, coupled with elevating the park-like elements to the roof, provides a sense of security for occupants and building visitors. Hence, the building is a catalyst for positive change through good design. Milena Murdoch reflected,“it is a great joy as an architect to see something you built being used as you expected. Then sometimes you create a place for people to use and for them to own it and say ‘I want to take care of this’ is even better!” The Murdochs believe it is forward thinking and pivotal to see a community such as South Los Angeles understand a need for such an innovative building even in its rougher neighborhoods. They recognize,though, that it takes a very special client to allow architects to create these influential projects and take the actions needed to realize it. “These are always team efforts. In order to do any kind of social type of project you have to have a client that is aligned with your values.” said Milena Murdoch. 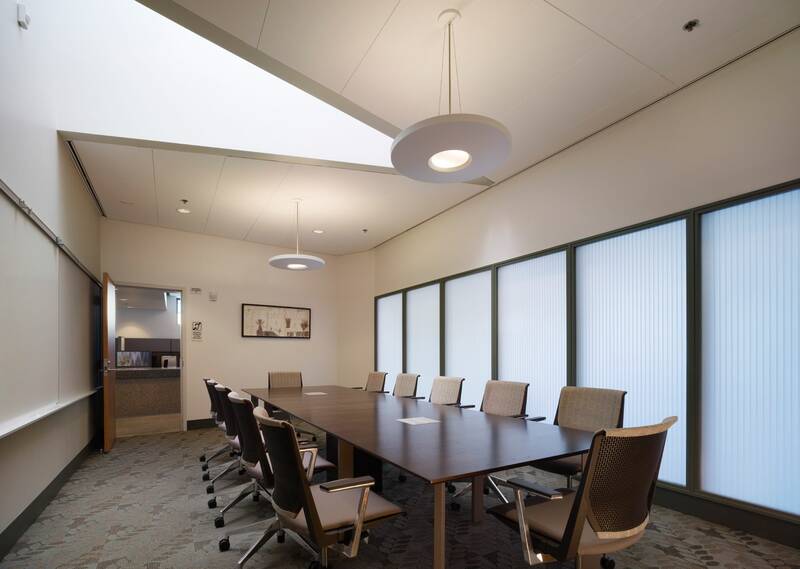 The Central Avenue Constituent Services Center not only was designed through the leadership of Ms. Perry, but it can also be interpreted that the community’s values led the design team’s efforts as well. This once thriving heart of culture in Los Angeles is on the mend due to collaborative efforts and thoughtful design. Though recent memories of crime and hardship may cloud the community’s perception of South Los Angeles, it is in this revitalization that hope springs forth to encourage the memories of good times had there so that they return and expand. The great jazz legend Louis Armstrong once said, “the memory of things gone is important to a jazz musician.” Likewise, it is the memories of “things gone” that helps this community focus in its efforts to bounce back.